Today is the birthday of Bill B. Van (William Webster Van de Grift, 1878-1950). He got his start as a child actor in a Philadelphia production of H.M.S. Pinafore, moved on to blackface minstrelsy, thence to vaudeville, burlesque and stock companies. In vaudeville in the teens he often appeared in an act with the Beaumont Sisters, one of whom (Nellie) was his wife for a time. 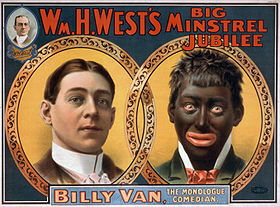 He also appeared on the vaudeville stage with the boxer Gentleman Jim Corbett, and wrote special material for Corbett (the always entrepreneurial Van wrote for other vaudeville acts as well). From 1903 through 1928 he also appeared in numerous Broadway shows starting with The Jersey Lily in ought three, and culminating with Sunny Days in ’28. 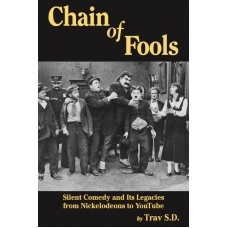 He also tried his hand at making silent films in the twenties, although this doesn’t seem to have led anywhere. For health reasons (he’d had TB when he was younger) he dropped out of performing in ’28, although by this time he was prosperous New Hampshire farmer and manufacturer (soaps and bath oils), and a popular public speaker, which was enough to keep him busy (and rich) until he passed away a couple of decades later. He also owned a casino and summer stock theatre on the shore of Lake Sunapee. Billy B. Van purchased my 2x great grandfather (Frank O. Holmes) farm house on Prospect Hill in Georges Mills and raise the gurney cows mention in this article. Frank also built the movie props and dressing rooms. Billy and Frank designed and built Vans Casino. There was an article in Yankee Magazine many years ago verifying these stories.